Our pH electrodes are designed to meet the requirements of a wide variety of laboratory applications. pH electrode options include single, double or triple junction, 3-in-1, micro for small samples, refillable or non-refillable and other special configurations like Iodine/Iodide reference, Platinum junction or ground junction. Please be sure to check out our wide selection of electrodes for all TruLab benchtop meter models! 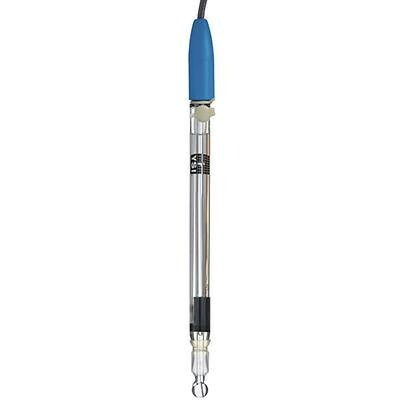 Science pHT-G, pH electrode, Double Junction, 3 in 1, ground joint junction, 170 mm length, glass shaft, 1 meter cable, BNC connector, 1 banana plug, NTC 30 kOhm. Item is heat packed in the winter months. Shipment must be made via 2-day or next day carrier during that time. The Science pHT-G features a ground joint junction with a relatively fast outflow of electrolyte (~ 3 mL per day). This fast outflow helps keep the junction clear, which makes the Science pHT-G electrode suitable for measurements in solutions with a lot suspended particles. Due to the fast outflow rate of electrolyte, it is recommended 3 M KCl electrolyte solution (250 mL) be ordered along with the Science pHT-G to ensure you don’t run out of reference electrolyte when taking measurements.